2006, year known as release of Range Rover Sport was undoubtedly Land Rover’s risky step to hit the already flourishing BMW and Mercedes SUV market. 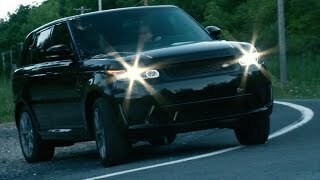 However with moving time company proved its mark and in present almost drained the planning of its competitors with the release of sporty Land Rover Range Rover Sport SVR 2015 as the most powerful Range Rover Sport till date. Let us have a descriptive look at this new unveil. Interior of Land Rover Range Rover Sport SVR 2015 showers sporty vibes through its 16-way adjustable, sporty leather seats. Land Rover has shown commendable engineering while designing the seats through the extra lateral support which they provided without compromising with your over seat comfort or legroom. Just like the front seats, rear seats too come in redesigned format allowing you to fold them completely and increase the luggage room if required. Land Rover Range Rover Sport SVR 2015 looks marvelous with its aluminum trim but still for carbon-fiber goers, company has an option for you to go with over, center console, dash, door panels and steering wheel bezel. Exterior of Land Rover Range Rover Sport SVR 2015 is loaded with some very attractive works. The list begins with the all new bumper housed in front fascia of Land Rover Range Rover Sport SVR. This now comes with two integrated large inlets on both sides while a massive air intake is located in center. Hood as well gets revised vents and this portrays company’s intention to keep the high performance engine and brakes cool and perfectly working. An all new grille now features a SVR badge mounted over the apron. Moving towards the rear fascia of Land Rover Range Rover Sport SVR 2015, first to grab our attention again was the bumper that houses black diffuser with quad exhaust pipes that add to the menacing look of Range Rover Sport SVR. More additions in the segment are huge spoiler, heavy wheel arches covering all new 21” alloy wheels and the fender vents. 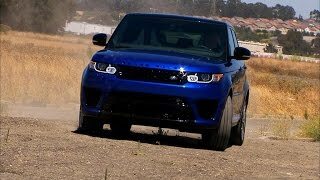 Land Rover Range Rover Sport SVR 2015 gets its power through the mighty 5.0 Liter Supercharged V8 engine delivering total output of 542 hp and peak torque of 680 nm paired to ZF 8HP70 8-speed automatic transmission. 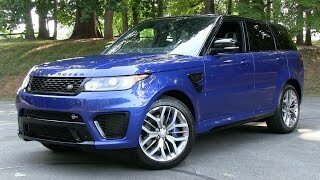 Land Rover Range Rover Sport SVR with this power will enthrall the streets by reaching 60 mph from standstill in just 4.5 seconds while the top speed is electronically limited to 162 mph.